Are you craving a sweet, minty fudge recipe? 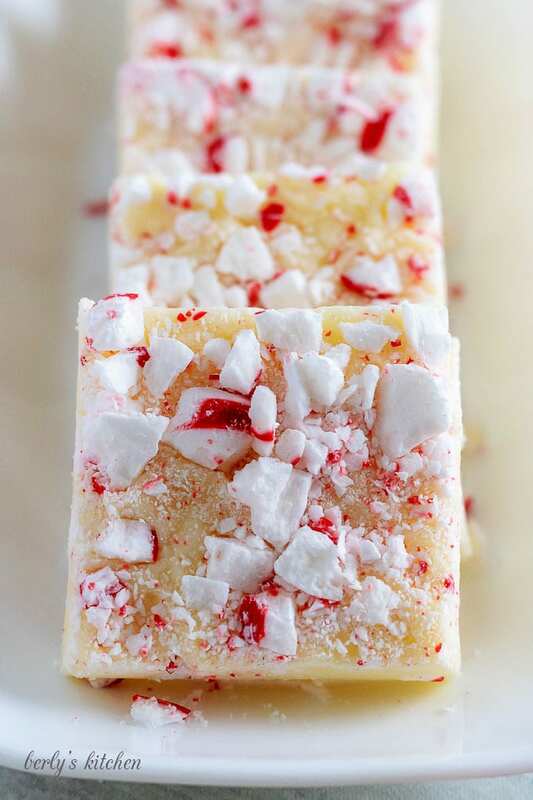 Then take a look at our white chocolate peppermint fudge. It’s the perfect blend of peppermint and chocolate! Kim and I have another holiday recipe we’re excited to share. It’s loosely based on her mint fudge recipe that we shared about a year ago. However, instead of using spearmint candies, she decided to make a fudge infused with peppermint flavors. We can’t wait for you to try this peppermint fudge. As the title implies, it’s easy to prepare and is made with white chocolate. Normally, we reach for almond bark when comes to making holiday candies, but this year Kim wanted to shake things up and experiment. So, she chose white chocolate chips since they’re pretty much available to everyone here in the States. 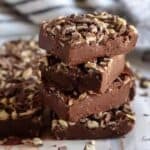 While the ingredient is easily accessible and delicious, it does have one major drawback in regards to making fudge. 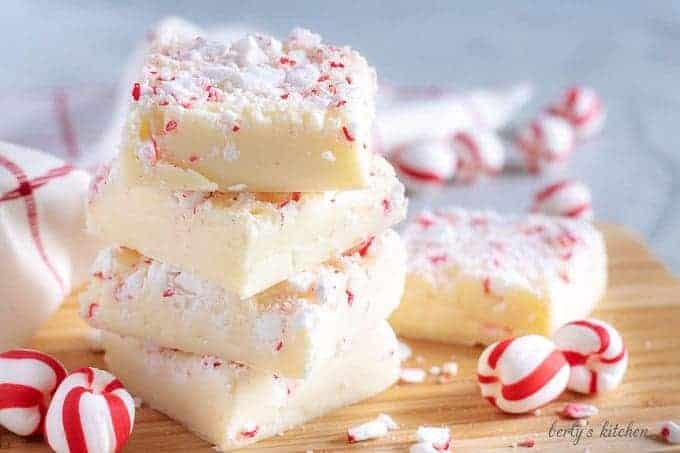 If you don’t have enough of them in the recipe, the peppermint fudge will be a soft, sticky mess. Make sure to add the right amount of chips; otherwise, I wish you the best of luck. Other than that one little hiccup, I think you’ll find this festive dish, simple and tasty. Let’s get started! First, start by gathering all your ingredients and lining a 9×9-in. baking dish with parchment paper. You may have noticed in the recipe card that Kim uses butter to coat the dish. The butter helps keep the paper in place when pouring and spreading the fudge. Which, makes for a prettier final product. Next, use your food processor, or a freezer bag and a kitchen mallet, to pulverize the soft peppermint candies into small pieces. A knife and cutting board works too, but you’ll probably have candy projectiles all over the kitchen. Once the candy has been prepped set it aside. 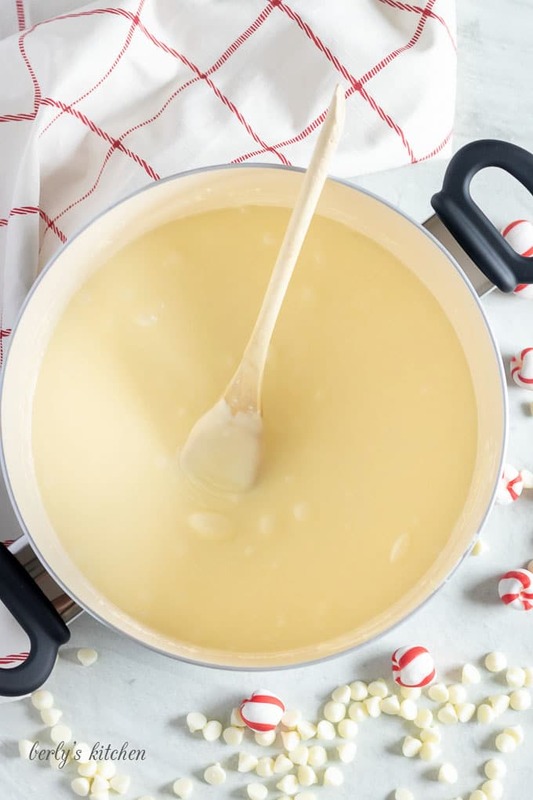 After that, in large saucepan, combine the white chocolate and sweetened condensed milk. While stirring over low heat, melt the chocolate and mix together the ingredients. It’s important here not let the chocolate scald or come to a boil. There’s a lot of sugar in that pan and it will burn quickly if you are not careful. Once the mixture is melted and thoroughly combined, remove the pan from the heat and get ready to add the next two ingredients. Now, stir in the peppermint extract and the vanilla extract. Then, carefully, pour the warm fudge into your lined baking dish. Kim likes to use a plastic or rubber spatula to smooth out the top the fudge. In addition to that, I always give desserts like this a small shake back and forth, once or twice. I know it sounds silly, but it’s an old habit that’s never failed me, whether it be cake batter, fudge, or no-bake cheesecake, a quick jiggle evens everything out nicely without the hassle of spoon marks. Afterward, sprinkle the crushed peppermint candy on top of the fudge. Using your fingers or the spatula, gently press the candy pieces into place. Now the hard part begins, waiting. Last, place the dish into your fridge for at least 2-hours to set. Since it’s the holidays, there’s a chance your fridge might be full, if so, leave it on the counter for at least 4-hours to set at room temperature. Try not to cut it before it sets. Other than that, you’re all set. It can be stored in a sealed container in your fridge for up to 3-days. 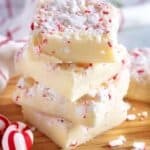 You don’t have to use soft peppermint candies, you can turn this into a candy cane fudge by simply substituting crushed candy canes for the softer candy. However, the white chocolate fudge will have quite a bit more crunch in each bite. If that’s your thing, then go for it. Sometimes, time is an issue, so you may need to take a shortcut, if so, then feel free to use your microwave to melt together the chocolate chips and condensed milk. I would recommend using a low power setting for 3-5 minutes. Also, don’t forget to stir the mixture every 20-seconds or so. Just use a microwave-safe dish, keep it covered, and try not to let it come to a boil. Our peppermint fudge is made using peppermint extract, now, if you don’t have that on hand, then you could try a few different substitutions. For example, peppermint vodka might work, but be careful how much you use because alcohol will affect how a product, “sets.” Another option is to grind some peppermint candy into a fine powder and add a tablespoon of the powder to chocolate as it melts. The point is, be creative and find a way to work around not having an ingredient on hand. Some people prefer peppermint bark to peppermint fudge. 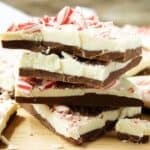 You can turn this recipe into peppermint bark by using white almond bark in place of the chocolate chips, leaving out the sweetened condensed milk, and using a sheet pan lined with parchment paper instead of baking dish. 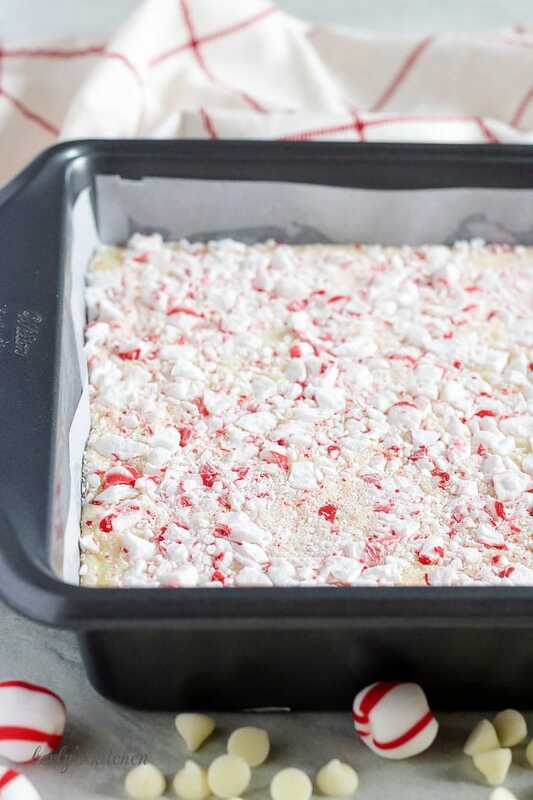 On the other hand, you could just use our peppermint bark recipe. Are you craving a sweet, minty fudge recipe? 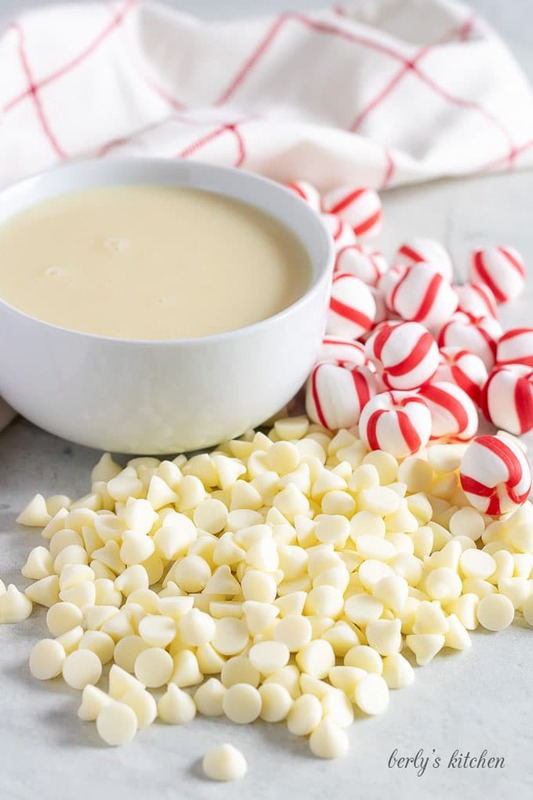 Then take a look at our white chocolate peppermint fudge. It's the perfect blend of peppermint and chocolate! First, coat a 9x9-in baking dish with butter and line it with parchment paper. Next, use a heavy duty food processor, or a plastic bag and meat mallet, to crush the peppermint candies. Set them aside. After that, in a large saucepan, heat the chocolate chips and sweetened condensed milk over low heat while stirring constantly. Keep stirring until all the chocolate has melted, then remove the pan from the heat. Now, add the peppermint and vanilla extracts and mix everything together. Then, pour the peppermint fudge into the baking dish and use a rubber spatula to smooth it out evenly. Afterward, sprinkle on the crushed peppermint candies and gently press the pieces into the warm fudge. 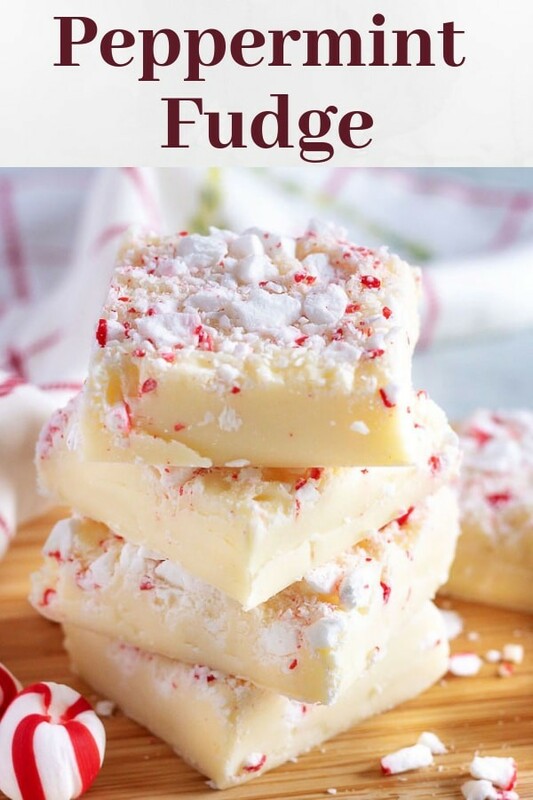 Last, place the peppermint fudge into your fridge to chill and set for at least 2-hours. Alternatively, you can leave it on the counter for at least 4-hours to set at room temperature.